At the Asian Cultural Center on Friday night, a table sat in the left side of the room filled with tomatoes, lemons, parsley, mint, olive oil and biscuit dough, among other ingredients. People in chairs lined the small living room space and many more stood overflowing in the adjoining rooms. Iman Alramadan, wearing pearls and a round black hat with a small flower accent, entered the room and stood behind the table of ingredients. The students and other guests were waiting for professor Alramadan to begin the ACC’s first cooking demonstration of its series held throughout the year. Alramadan showed the group of more than40 people how to make two traditional dishes: tabbouleh, a parsley, wheat and tomato salad, and manakish, a small doughy flatbread topped with different seasonings. “These dishes are very simple and easy for you as students,” Alramadan said. Alramadan said she decided on demonstrating these specific dishes not only because they are simple to make, but also because they are healthy and less expensive than restaurant food. Many of the people attending Alramadan’s demonstration said it reminded them of a cooking show. Alramadan herself said she felt like a show host. 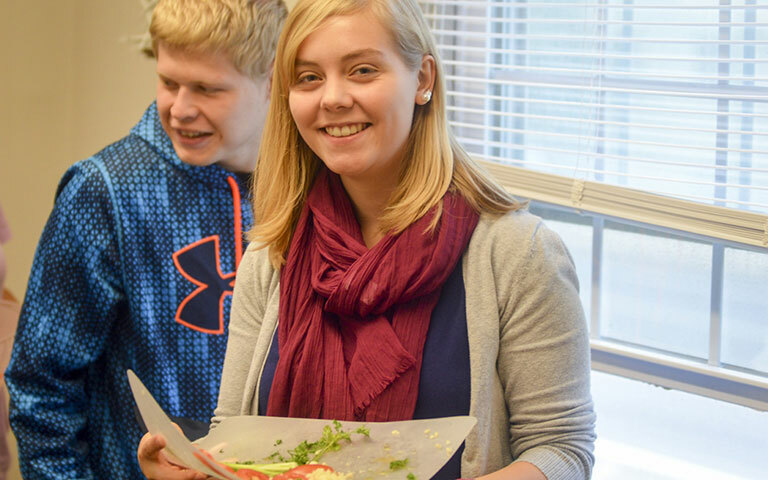 IU graduate Autumn Mitchell said that Alramadan was very energetic and the right person to make a fun and interesting cooking demonstration. Alramadan’s appeal to the attendees was evident throughout her hour-long demonstration. People were engaged in the presentation, laughing at her joyful style of teaching. “Could we sing a song about tabbouleh?” she said jokingly to the group. Alramadan’s cultural roots also helped her teach the cooking lesson. Alramadan shared multiple insights from her time living in Syria into the food she created for the group. Tabbouleh is a common side dish that people eat with meals or for a snack. Manakish is served as a breakfast food, often with tea. Apparent in her cooking, too, is her family’s influence. When making the manakish, she used store-bought dough instead of homemade. Mitchell said she also enjoyed the manakish, especially the one with spicy topping. One ingredient on the table stood out as especially important to Alramadan: Zataar. The blend of thyme and other dried herbs is very famous in Middle Eastern cooking. Alramadan said although her children eat cereal for breakfast on weekdays, she makes a point to cook with Zaatar on the weekends. Throughout Alramadan’s lively demonstration, her passion for food and the culture behind it helped attendees appreciate and enjoy the dishes she created.